Please accept my most humble obeisances, all glories to Srila Prabhupada. Yes, this letter is sweet beyond words. It just shows that Srila Prabhupada is as near and available to anyone who has the love, faith and enthusiasm to approach him. Even when Srila Prabhupada was physically present, most devotees had no access to him. But this is not because Srila Prabhupada was inacessible; it was because most dared not to come too near to him, because one had to be prepared to carry out any and all orders that might come from Srila Prabhupada under the inflow of the divine inspiration of Krishna. After all, Srila Prabhupada is the transparent medium, the channel of communication to and from Krishna. It is a two-way channel. It stands to reason that his books, in his absence, are now the two-way channel, transparent medium to Srila Prabhupada and Krishna. Although apparently only a binding of paper and ink, we say they are spiritual. So how are they spiritual? Herein lies the inconceivable achintya shakti, spiritual mystery of the transcendental world. Matter cannot make use of spirit; rather, spirit makes use of matter. Thus anything properly related to Krishna by his agent, the transparent medium, has all the potency of Krishna. The spiritual world is not in the material world. The material world is a small part of the spiritual world, just as San Quentin prison is part of California--not that California is part of San Quentin. 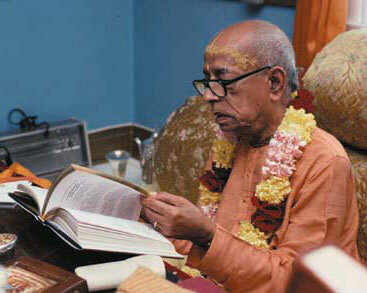 If Srila Prabhupada is not spiritually available in his books, then certainly Krishna is also not there. Then what is the use of such books? This question should be resolved. Is he, Srila Prabhupada as good as his books, or is he not? Absolute means no difference between the person Bhagavat and the book Bhagavat. In the purport of Srimad Bhagavatam , Canto 1, Chapter 2, Text 18, Srila Prabhupada writes: "The remedy is the association of the BHAGAVATAS. There are two types of BHAGAVATAS, namely the book BHAGAVATA and the devotee BHAGAVATA. Both the BHAGAVATAS are competent remedies, and both of them or either of them can be good enough to eliminate the obstacles…." Now someone may object by quoting the last sentence of this same purport where Srila Prabhupada says "The messages of the book BHAGAVATA therefore, have to be recieved from the devotee BHAGAVATA, and the combination of these two BHAGAVATAS will help the neophyte devotee make progress on and on." This may sound like a valid argument, but I say that the book BHAGAVATA which was given to us by Srila Vyasadev, coming down through the disciplic sucession to Srila Prabhupada, was subsequently translated and purported by him [Srila Prabhupada] especially for the people of this modern age of western industrialized, technologized and sin-saturated society. Therefore what we have in the Book BHAGAVATA and the BHAKTIVEDANTA PURPORTS is in fact the book BHAGAVATA and the person BHAGAVATA all in one presentation. As Srila Prabhupada's disciples our function is simply to deliver these two BHAGAVATAS, the book and the person, Srila Prabhupada. It is the function of the disciples to confirm the instructions of the spiritual master, and give assistance to the new candidates. It is not their function to use Srila Prabhupada's books for alluring new candidates to increase their personal following, as it seems to be the case today. You might go have a reading in the next chapter ( Srimad-Bhagavatam 1.5.24 - 26) about the mercy and spiritual nature of "THE BHAKTIVEDANTAS". I also have an interesting letter in that connection. I will forward that to you. In the future we may have to be known as "THE BHAKTIVEDANTAS" in order to distinguish ourselves from so many camps and contending elements. Just as Srila Prabhupada insisted on calling his society KRISHNA Consciousness and not GOD Consciousness, at some point it must be clear that one is a follower of SRILA [A.C.] BHAKTIVEDANTA SWAMI PRABHUPADA as per his BHAKTIVEDANTA PURPORTS, or that one is simply following something else.